L-R Matt Kirby winemaker, Tim Turvey and Helma van den Berg. co-founders Clearview Estate winery, Te Awanga with Reserve Chardonnay soon to feature on Air NZ flights. Since it was first released 25 years ago Clearview Estate's Reserve Chardonnay has picked up accolades year after year, but it is only now set to take off - with Air New Zealand. The wine will take to the skies in the airline's business premier class on international flights after being included in its 2017 Fine Wines of New Zealand list. The wines list features 60 of the country's most acclaimed and prestigious wines and from August Te Awanga-based Clearview's annual winner will start being served up from the Air New Zealand inflight wine list. 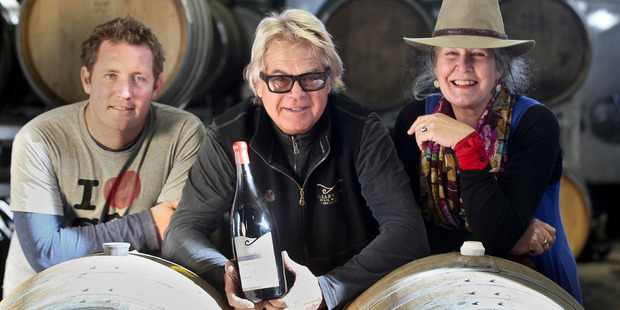 "We are absolutely delighted," said winery co-founder and original winemaker Tim Turvey. "To be selected by New Zealand's leading masters of wines and master sommelier for such a flagship New Zealand company is hugely gratifying." The Fine Wines of New Zealand programme is in its second year with Air New Zealand acting as its patron. The wine list was compiled by masters of wine Alistair Maling, Michael Brajkovich, Sam Harrop, Simon Nash and Steve Smith, with master sommelier Cameron Douglas. For Mr Turvey's fellow Clearview founder, Helma van den Berg, being selected for the wine list on the airline's international routes is hugely important in the marketing sense. "Getting on to the list means establishing a long-term partnership with Air New Zealand," she said. "As well as helping to promote our brand on board, the wine will be marketed by Air New Zealand at its offshore events and promoted to contacts globally, which will increase our international brand exposure." Mr Turvey described the latest accolade for the long-standing Reserve Chardonnay as "very exciting". It came just after the 2014 vintage chardonnay was named as Best Imported White Wine at the Expovinis international wine fair in Brazil. "It's always nice to know you're up there with the best." The Reserve Chardonnay first emerged in 1991, steered in the winemaking sense by Mr Turvey and in recent years by winemaker Matt Kirby, who joined the estate production team three years ago. He could've once been the driver who hurt others, says dad who lost half his family. The two freehold sites on the corner of Rata St and Nikau Cres are up for sale.